It seemed like a down year in 2018 for the Cubs offense, and it somewhat was. 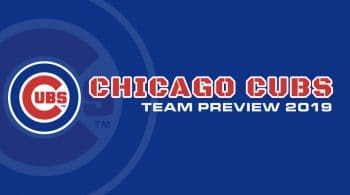 The Cubs core has been intact for a few years now, and that won’t change in 2019. Anthony Rizzo and Kris Bryant are the one-two punch in the middle of the order, but the names around them will need to pick things up. Guys like Ian Happ, Ben Zobrist, and Jason Heyward are in dire needs of consistent performances. The on-base guys have to do a better job to give both Rizzo and Bryant more RBI chances. Javier Baez is coming off a career season, and even if he drops down a bit, the production he brings is huge. Kyle Schwarber and Willson Contreras are two familiar names, but the career path wasn’t where they wanted it to be in 2018. The Chicago Cubs have somewhat of a make or break rotation this season. They had Yu Darvish go down with a season ending injury last season, Jon Lester out-pitched his ERA estimators, and Jose Quintana was very inconsistent. Adding Cole Hamels was a huge win for them, as he looked like his old self, and certainly looked to enjoy pitching out of Texas and back in the National League. Hamels is likely going to be a low four ERA type arm, and hover around a strikeout per inning as well. He is another year older, and his off-speed stuff is keeping him alive. Expectations for him have to be tempered a little bit, which could be frustrating if the rest of the rotation as issues. Lester had a 3.34 ERA, 4.43 xFIP, and 4.57 SIERA. His groundball rate dropped almost 10%, and soft-contact dropped 3%. He had his lowest swinging strike rate since 2013, and there is a concern for Lester heading into the season. Lester won’t turn into a gas can, but the ERA should be about a half a run to a full run higher than 2018. Darvish is expected to be ready for Spring Training, and be 100% for the start of the regular season. This is good news for Cubs fans, as Darvish can help sure up this rotation. This rotation is incredibly deep, and even if Lester and Quintana struggle a bit, they are still better than most teams backend starters. Darvish should be limited a bit by Chicago as projections have him around 130-140 innings with above average strikeout numbers. Walks were a weird concern last season, but could be tied more to his health. Tyler Chatwood didn’t pan out for Chicago, as he had a higher walk rate than strikeout rate, with a 5.76 xFIP. Chatwood won’t be finding his way into the rotation this season, barring injuries. Kyle Hendricks continues to be a model of consistency, and is reliable for eating up innings. Hendricks led the team in innings pitched last season, and had the second best ERA on the team. He isn’t a flamethrower nor does he have huge swing and miss stuff. He induces a lot of pedestrian contact, and limits damage. Hendricks will likely be leading this staff this year, as of now he is penciled in as the ace.